Auditions for the musical "Cabaret" will be held on July 13th and 14th at 7 PM. The auditions will be held at the Western Heritage Museum, 5317 Lovington Highway, Hobbs, NM 88240. Saturday will be music auditions, cold reads and a couple selected songs from the show. Sunday will be dance, more cold reads, and songs. For the singing auditions you need to prepare a short song (16-32 measures of music will suffice). You can bring your music on a CD track, or if you have it on a smartphone/tablet we will have a compatible speaker available. There will not be an accompanist for this audition. For the dance audition, please wear clothing that you can move in. 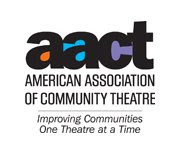 "Cabaret" will be directed by Nathan Miles ("A Doll's House", "Fiddler on the Roof"), with music direction by Daniella Michelle Mendez and choreography by Karen Salb of Maciolek School of Dance. Also...we are looking for musicians as well, including a band that will be in the show itself. So pass the word along to your musically inclined friends, here is a chance to be in a musical even if you are not an actor/singer. See the end of this list for musicians needed! Show dates are September 13, 14, 15, 19, 20, 21. Clifford Bradshaw – Vocal Range – Tenor – Description – American Novelist traveling to Berlin –Appearance Age range Late 20’s to Mid 30’s in age. Speaks with an American accent. Fraulein Schneider – Vocal Range – Alto ‐ A landlady who rents rooms in her large flat. Appearance Age Range 50+. Requiring an ability to deliver lines with a German accent. Comfortable with stage movement and light dance – waltz. 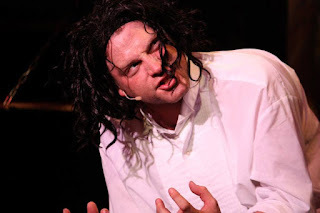 Herr Schultz – Vocal Range – Tenor – One of Fraulein Schneider’s roomers and the proprietor of a Fruit Shop. Appearance Age Range 50+. Requiring an ability to deliver lines with a German accent. Comfortable with stage movement and light dance. 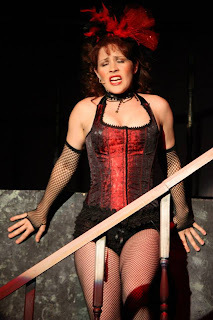 Sally Bowles –Vocal Range – Mezzo– able to belt the song– A British Cabaret. She is the star singer at the Kit Kat Klub. A quirky character that comes across as flighty – yet at times struggles with knowing the darkness of the reality of her life as a cabaret performer. Appearance Age Range – 20’s to 30’s. Speaks with a British Accent. Ernst Ludwig – Sings in the Chorus – A friendly and likable German – Speaks with a German accent. Comfortable with stage movement and light dance – waltz. Appearance Age Range – non specific. 5 to 7 individuals as Kit Kat Klub boys – Ensemble singers – various vocal ranges – must be able to dance. The individuals will also be part of various scenes as performers and as club patrons. Some of the individuals will be German Sailors who frequent Fraulein Kost’s services. 5 to 7 Kit Kat Klub Girls – Ensemble Singers and Dancers ‐‐ The individuals will also be part of various scenes as performers and as club patrons. Some of the individuals will be chosen for small feature roles. Max – Non‐Speaking role ‐ Sally’s jealous Klub acquaintance – Ensemble Dancer – Klub patron. Assistant Customs Officer – Non Speaking Role – will also participate as patrons and party guests. Taxi Man – Non Speaking role – also participates as party guest and Klub patron. 2 Nazi Guards – Non Speaking roles – also participates as party guest and Klub patron. Stage Band – looking for individuals can also play the following instruments – Tenor Sax, Trombone, Drums, and Piano/Accordion. This is a great opportunity to show off your musical talents on stage. Congrats to the cast of Little Mermaid Jr.!!! Tickets are now on sale for "The Little Mermaid, Jr."
Yes, kids...I know you are waiting for a cast list. Sorry...the only news I have for you is that tickets are now on sale! 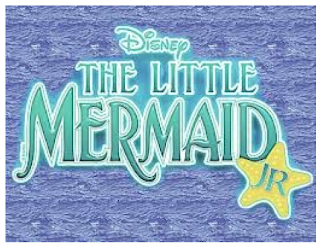 "The Little Mermaid, Jr." shows are July 18th-20th (7:30 PM) and July 21st (2 PM), all seats are $10. You can get your tickets by clicking here. 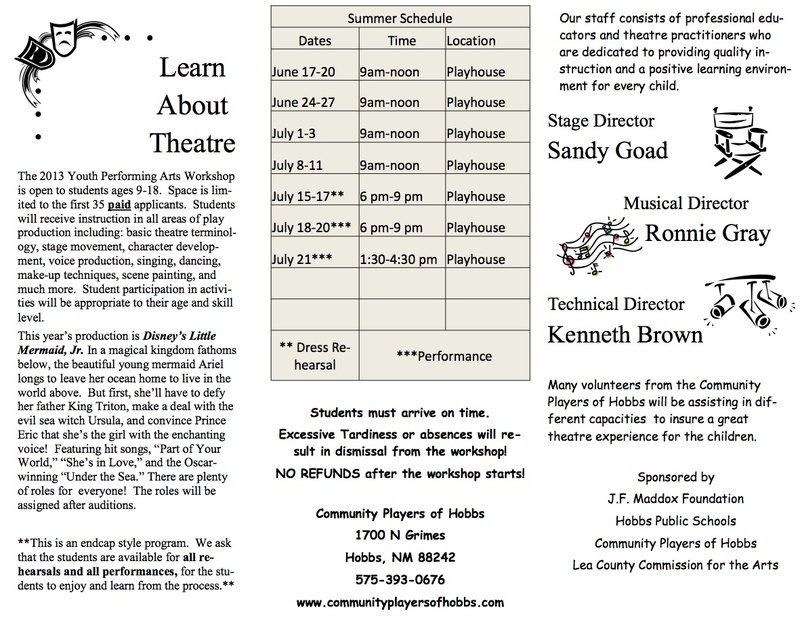 This year, the Youth Performing Arts Workshop (YPAW) will be presenting Disney's The Little Mermaid, Jr. Once again, Community Players of Hobbs staff and volunteers will be working with the children, helping them learn multiple theatrical skills. Registration begins immediately and goes until the workshop is full (the first 35 paid participants). See below for more information and for the application (click here for a PDF printable application). 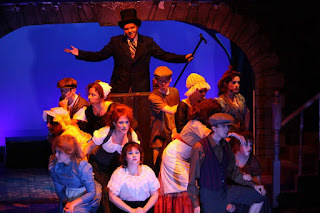 "Jekyll & Hyde - The Musical" opens tonight! "Jekyll & Hyde" is a musical tragedy based on the novella "The Strange Case of Dr. Jekyll and Mr. Hyde" by Robert Louis Stevenson. "Jekyll & Hyde" ran on Broadway for 1,543 performances, from 1997 through 2001. Don't miss "Jekyll & Hyde"! All seats are $15. Get your tickets by clicking here (or the ticket icon on the left of this page). Get your tickets now for "Jekyll & Hyde - The Musical"! Tickets are now on sale for "Jekyll & Hyde", the musical extravaganza directed by Juston Harlin ("Beauty & the Beast", "I Love You, You're Perfect, Now Change", "Urinetown - The Musical").